We’d love your help. Let us know what’s wrong with this preview of Dog Gone (The Paws and Pose Mysteries Book 3) by Shannon Esposito. As suspects pile up, a rans It’s Christmastime on the exclusive island of Moon Key and Elle Pressley, doga instructor, is excited about her new client—movie star, Talia Hill. But that excitement quickly turns to shock when Ms. Hill’s dog nanny is found dead and her beloved terrier, Ginger, goes missing. With the help of her P.I. boyfriend, Elle leads the search for Ginger. To ask other readers questions about Dog Gone (The Paws and Pose Mysteries Book 3), please sign up. Shannon Esposito writes a doggone great story! Having enjoyed the two previous stories in the Paws and Pose series, I quickly downloaded book 3. 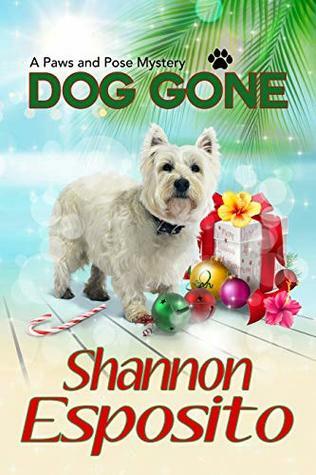 If you love dogs, you’ll enjoy the antics of this plot as protagonist Elle Presley leaps into the fray of a murder and dognapping on a beautiful private island in Florida where she works at a pet spa/resort teaching doga classes. The story has a sweet para-twist, also. I highly recommend book 3. An intriguing mystery and awesome characters. Who could ask for more? Dogs! I'm hooked! I love Shannon Esposito's Pet Psychic series so I was excited to see that she had a new one out Paws and Pose Mysteries. I was thrilled a to get the chance to read and review the arc of the third book, Dog Gone even though I had not had the chance to read the first two, although I had recently added them to my Kindle. I enjoyed Dog Gone so much that as soon as it came out, I grabbed a personal copy. The mystery An intriguing mystery and awesome characters. Who could ask for more? Dogs! I enjoyed Dog Gone so much that as soon as it came out, I grabbed a personal copy. The mystery was complex and hooked me almost from the beginning and I quickly came to care about the characters. Ms. Esposito has a talent at creating people with whom I can connect and one way she does that is through the many wonderful dogs on the island. These people are my kind of people; their dogs are their families. There was one minor character that especially touched me and can't wait to see more of Angel! Fantastic series! I read the first two books previously, and when I looked up another series by the same author, I discovered this one had been released and I didn't know it! I read it in two days, it kept my constant attention. Sure wish I could take her doga class! A large glass sculpture of her beloved dog upsets HOA decorating rules. Talia refusing to take down her sculpture leads to murder and mayhem and a kidnapped dog.